Term is now in full swing and the children are enjoying a whole range of lessons. I thoroughly enjoyed observing Mrs. Richards' Year 2 class on Wednesday morning. 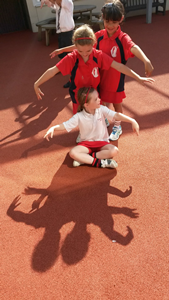 The children re-enacted the fairy tale, 'The Princess and the Dragon', every one of them with enthusiasm and confidence. Adjectives were used, impressive vocabulary was singled out for praise and every child seemed to thoroughly enjoy the lesson, watched over not only by Mrs Richards but by a knight in shining armour, brought in by Mrs Terry, much to the excitement and approval of all. I have also enjoyed teaching Year 8 to think about current issues and about their world. Presently we are considering the impact which the forthcoming referendum in Scotland might have on Great Britain, and I have been impressed by the thoughtful, intelligent response. It is so important for our children to think about important news and developments in their world, and I am delighted that they are so keen to do so. Sports fixtures have begun in earnest with matches against Lancing Prep School and Brighton College Prep School as well as tournaments on which there are reports within. I have been delighted that some of the younger pupils have read out reports in School Assembly with great confidence, led by our sports captains. There have been trips to the beach for Year 1, to Woods Mill for Year 4, and to Christ's Hospital for four of our Year 5 mathematicians. The four pupils who took part should be commended for coming second out of eighteen in the team mathematics competition. 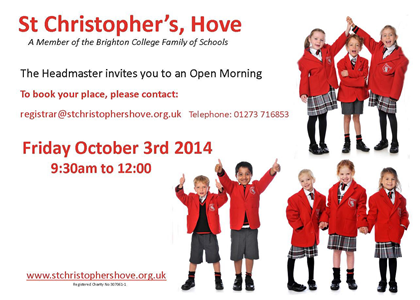 I will finish by wishing all the children in Year 7 going to Brighton College for their Pre-test the very best of luck. The first few days of a new academic year are always exciting. The children, however much they have enjoyed their holidays, are ready for school and all that it offers: time enjoying the company of friends of their own age, the opportunity to learn and to discover, the structure that many children enjoy, and rich opportunities. The children have already been coming in hordes through the doors of my study to show me their holiday diaries. I have thoroughly enjoyed talking to them about happy sun-baked days and they have taken great pride in telling me about wonderful experiences. I was particularly pleased to hear that good old-fashioned entertainment such as blackberry picking, visits to castles, and day trips to London excite as much as exotic trips abroad. 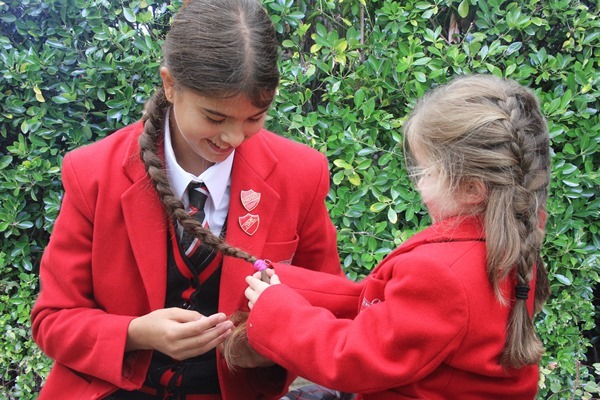 New pupils, naturally anxious on their first day, already seem very settled and to be making friends and there is that sense of joy and energy in the school as sunny September days begin to replace slightly grey August ones. I spoke to the children in our first Assembly about three of the things which are central to St Christopher's and which we are very keen to nurture: kindness, curiosity and confidence. I also used a story, slightly embellished I fear, about my own holidays to encourage them to understand that life has its downs as well as its ups and that it is how we respond to the downs that often defines us. My wife has a favourite saying, 'Don't wait for the rain to stop, learn how to dance in the rain (it should possibly be 'puddles'). Though I often find my wife unfathomable, I finished by asking the children to ponder what that meant. I wish all of your children a rich, happy and fulfilling academic year.